When people question the cost of Made to Measure there are many benefits us Local Curtain Makers bring to the table… Quality lining or lining suitable for a certain job, access to the latest fabrics and accessories, personalised hand finished and other factors what go in to making a blind or curtain… We choose reliable suppliers, products that are made to last, install and take down easy, fittings and accessories that are durable…. So next time you or some one you know says….. Made to Measure is expensive, the answer is probably YES, a little more expensive but it’s usually for a reason. If you where given a blank cheque what car would you buy…. Ask why you choose that car, Prestige, build quality, still has value and looks good years later, trouble free. Your local curtain maker tries to offer you all these things and it’s not made in China but made “for you” here in your community…. 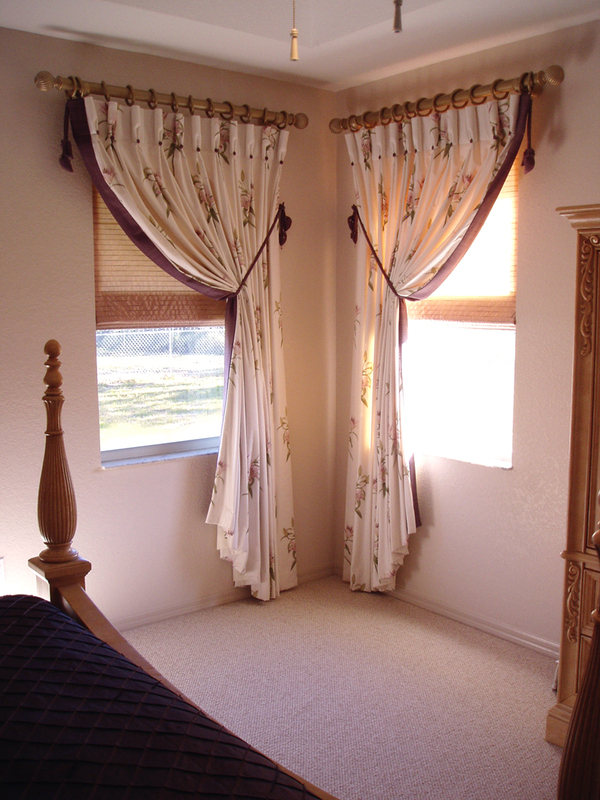 Silk blinds with individually hand stitched glass beeds along the bottom edge. Custom made curtains for this unusual window. The tie backs and pole drops where scraps of fabric…!